How does a steam turbine work? The thermal energy contained in the steam is converted to the mechanical energy by expansion through the turbine. The expansion takes place through a series of fixed blades (nozzles), that orient the steam flow into high speed jets. These jets contain significant kinetic energy, which is converted into shaft rotation by the bucket-like shaped rotor blades, as the steam jet changes direction (see: Law of conversation of momentum). The steam jet, in moving over the curved surface of the blade, exerts a pressure on the blade owing to its centrifugal force. Each row of fixed nozzles and moving blades is called a stage. The blades rotate on the turbine rotor and the fixed blades are concentrically arranged within the circular turbine casing. In all turbines the rotating blade velocity is proportional to the steam velocity passing over the blade. If the steam is expanded only in a single stage from the boiler pressure to the exhaust pressure, its velocity must be extremely high. But the typical main turbine in nuclear power plants, in which steam expands from pressures about 6 MPa to pressures about 0.008 MPa, operates at speeds about 3,000 RPM for 50 Hz systems for 2-pole generator. (or 1500RPM for 4-pole generator), and 1800 RPM for 60 Hz systems for 4-pole generator (or 3600 RPM for 2-pole generator). A single-blade ring would require very large blades and approximately 30 000 RPM, which is too high for practical purposes. Therefore most of nuclear power plants operates a single-shaft turbine-generator that consists of one multi-stage HP turbine and three parallel multi-stage LP turbines, a main generator and an exciter. HP Turbine is usually double-flow reaction turbine with about 10 stages with shrouded blades and produces about 30-40% of the gross power output of the power plant unit. LP turbines are usually double-flow reaction turbines with about 5-8 stages (with shrouded blades and with free-standing blades of last 3 stages). LP turbines produce approximately 60-70% of the gross power output of the power plant unit. Each turbine rotor is mounted on two bearings, i.e. there are double bearings between each turbine module. In these turbines the high-pressure stage receives steam (this steam is nearly saturated steam – x = 0.995 – point C at the figure; 6 MPa; 275.6°C) from a steam generator and exhaust it to moisture separator-reheater (point D). The steam must be reheated in order to avoid damages that could be caused to blades of steam turbine by low quality steam. The reheater heats the steam (point D) and then the steam is directed to the low-pressure stage of steam turbine, where expands (point E to F). The exhausted steam then condenses in the condenser and it is at a pressure well below atmospheric (absolute pressure of 0.008 MPa), and is in a partially condensed state (point F), typically of a quality near 90%. Since the steam turbine is a rotary heat engine, it is particularly suited to be used to drive an electrical generator. 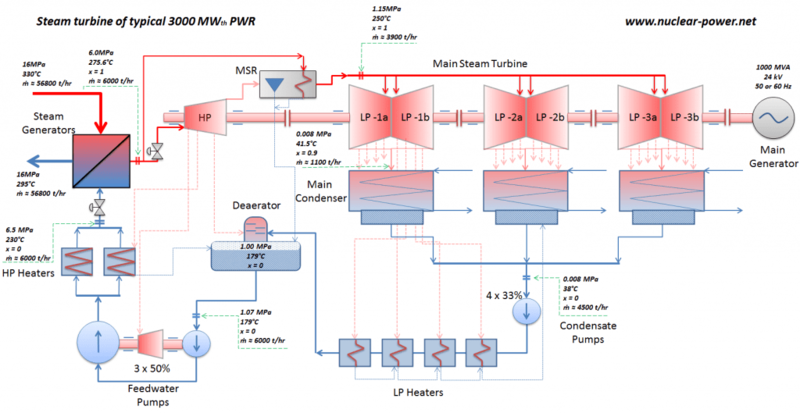 Thermal efficiency of a steam turbine is usually higher than that of a reciprocating engine. Very high power-to-weight ratio, compared to reciprocating engines. Fewer moving parts than reciprocating engines. 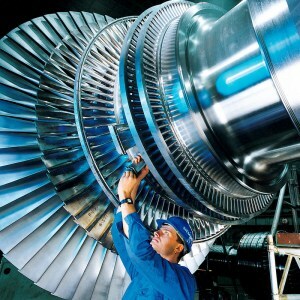 Steam turbines are suitable for large thermal power plants. They are made in a variety of sizes up to 1.5 GW (2,000,000 hp) turbines used to generate electricity. 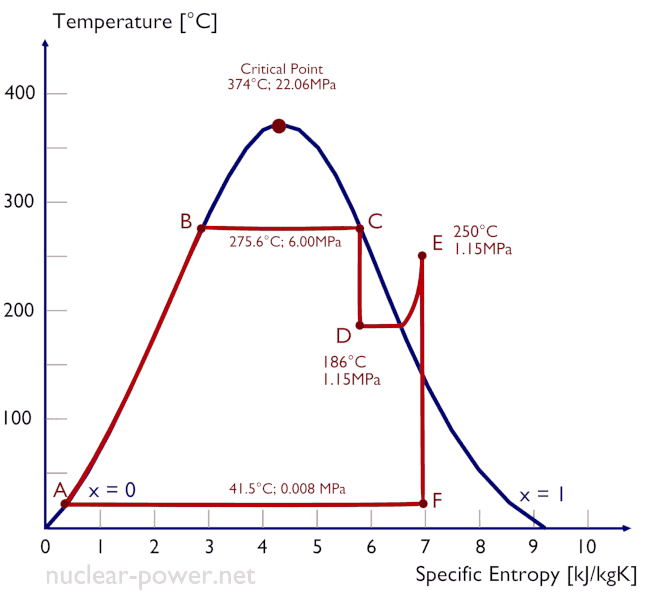 In general, steam contains high amount of enthalpy (espacially in the form of heat of vaporization). This implies lower mass flow rates compared to gas turbines. In general, turbine moves in one direction only, with far less vibration than a reciprocating engine. Steam turbines have greater reliability, particularly in applications where sustained high power output is required. Although approximately 90% of all electricity generation in the world is by use of steam turbines, they have also some disadvantages. Steam turbines are less efficient than reciprocating engines at part load operation. They have longer startup than gas turbines and surely than reciprocating engines. Less responsive to changes in power demand compared with gas turbines and with reciprocating engines.